"They" say variety is the spice of life. I say, who the hell are they? I don't think I like spice but I do like variety—sometimes. I love to vary the place I eat. I mean, don't your peeps love to eat out occasionally? So does this little kitteh. My placemat and food/water dishes were always in the kitchen. That is, until TW started dropping things out of the cabinet onto my head while I was eating. You might remember the tale of the Quick Oats. Our galley kitchen is 7 x 7 and that's including the appliances so that'd leave about 7 x 3 feet to actually walk in. When the kitchen was remodeled several years ago, the peeps got the bright idea to put cabinets above my feeding station. Not a good idea to inconvenience the cat. The "Litterbox Lounge" is halfway between my normal feeding station and my litterbox. Unfortunately, the placemat comes with my bowl since this is squarely on the rug in the hall. 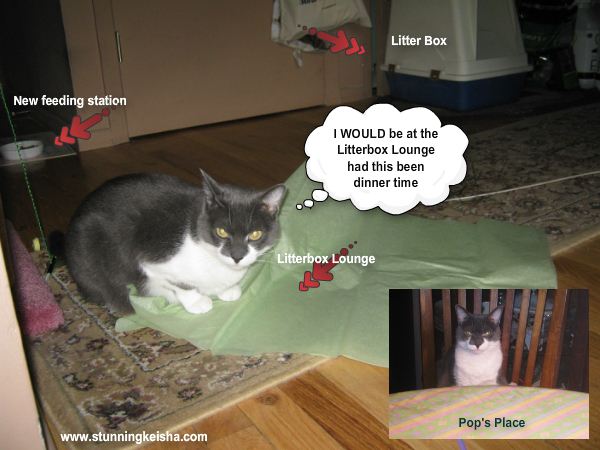 Even though, Pop's Place is off the ground, I consider the Litterbox Lounge more upscale, since it's carpeted. "Pop''s Place" is self explanatory. It's on the table where Pop's food usually sits. I'll go there for a leisurely Sunday brunch. Yes, I get to sit ON THE TABLE! How many of you guys get your meal ON the table? A diagram of my new feeding station and the "restaurants" I frequent. 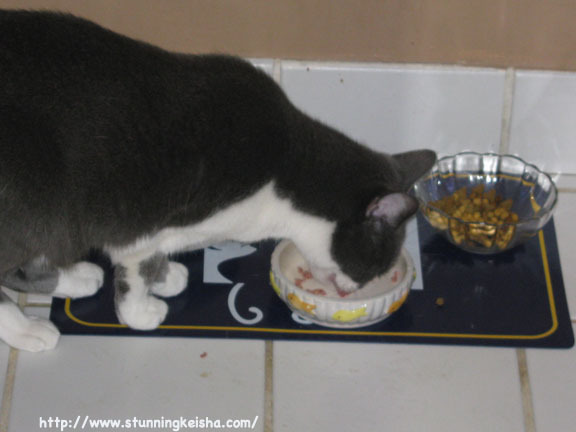 My kibble dish and (heh heh) water dish are still in the kitchen. I think TW is trying to discourage me from eating my kibble. BREAKING NEWS: TW ordered a Drinkwell Fountain for me!!! Finally! I had a cheap ripoff fountain a few years ago that I wouldn't use. I believe TW has threatened me if I don't drink from the Drinkwell that she paid a lot of green papers for. I take that as a "dare" so we'll have a standoff for sure. As my furrends know, I haven't drank anything except the pumpkin soup in my grain-free food since September 2010. The peeps don't know what turned me off water. They suspect it was the anti-plaque stuff the v-e-t told them to mix in it. They have water bowls in every room for me and they stand untouched. As a Great Man—as opposed to "they"—once said: Water rusts your stomach. That Great Man was my Grampa. Water rusts your stomach , that is funny! I think you should insist on eating at Pop's Place all the time, Cathy. We will await your further stories regarding the Drinkwell fountain. CK, That is hard to believe that you don't drink any water but guess you get your liquid from canned food.Too funny about water rusting your stomach. Love all your dining places. We eat all over the place too. Have a great day. I hope you will enjoy Drinkwell fountain! Concats on your Drinkwell! And I too have from time to time gotten to eat on the pawrents' table! I am glad that you have so many places to dine - it just proves how well trained you have your humans, CK! You certainly do have them well trained! Perhaps it's time to start demanding yet another feeding station.. try their bed, soft, cushy, a great place to nap after eating too! MOL! Oh no...water rusts your stomach? Too funny! You are a very smart kitteh! It's great to meet you - off set!! I do like the sound of the Drinkwell fountain - I like water out of the hose after our run in the morning, out of the toilet (yeah, Mum isn't a fan of me drinking from there…..) and out of the bottom of the plant pot - if I get really thirsty I'll drink out of my water bowl, not my first choice!! Mum says I'm weird - huh? Oh yes, eating out is much nicer! I hooe you enjoy you fountain, we would be lost without ours! Oh and ON THE TABLE??? Well, not in MY lifetime! ha! But since I'm on my own, I think I'll go paw up that glass top table Glogirly and Gloman hardly ever eat at. Thanks for visiting me during my staycation! That is a lot of options for foods in your house. That rusting of stomach is possible with some water which is why I am picky with mine. CK, I know what you mean about needing different places to eat. Sometimes I like to eat up on the counter. And my mom lets me...sometimes. I like eating at eye level. We can't wait to see what you do with that new fountain. Gasp - you haven't had water in how long? You certainly don't think you are a camel do you CK? I'm glad you got a Drinkwell. It took me awhile to get used to mine tho and sometimes I still ask for water in the bathroom sink. M picks me up and carries me to the fountain over and over hoping I'll get the hint. I do really most of the time jump up there, but geeesh - I really like the bahtroom sink!! I used to dine in the kitchen but I felt insulted being exiled from where the Human and sometimes her guests consumer her meals. So now, I dine more elegantly (ha ha) on my green plastic tray in the dining room. My Human looks at those fountains and ponders: Would is scare me so much I would nefur drink water again? (I am, as you know, quite the coward). Yes, darling, that invasion of the flashy box could have been VERREH unfortunate if I had had a "guest." I look forward to your reflection pictures. Do you know the Human did not even pay attention to MY reflection in that picture until you mentioned it??? Hi! Just wanted to let you know that we passed the Sunshine Award along to you! We has a drinkwell fountain! We also has lots of water bowls (OK 2). And Mommy always adds water to our wet foods, because me don't drink enough. Kozmo and me share the same food dishes and they are on top of the portable dishwasher. The hairy slobbery sisters have a nice placemat on the floor and they get separate dishes (why them and not us cats, me constantly wonders that). Our foods is up because the hairy slobbery sisters would eats it! Me thinks yous will like the drinkwell! Senile Saturday—New York Eye, Ear & Whaaat?? The Attack of the Killer Moths!